We are equipped to ship our sheet metal products anywhere in the United States or Overseas. New England Pick-up and Delivery Services are also available. Services at RANALL SHEET METAL TECHNOLOGY INC.
We will meet your sheet metal capabilities and requirements whether it be for stainless steel, steel, aluminum and most any type of metal. Our full service job shop services includes Prototype, Production, Assembly, Welding, CNC Machining and more. Engineering Tools are paramount in the sheet metal fabrication business. 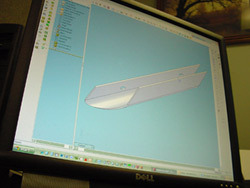 Using the latest in computer aided technologies, we will manufacture your sheet metal parts from drawings, CAD files or engineering designs to meet your production schedule or engineering needs. The use of SolidWorks 2012, Kubotek Key Creator 3.0. CADKey 19™ and the FabriWIN-G, AP100US programming system from AMADA™ allows us to work with your electronically transferred CAD files in a user-friendly environment, resulting in shorter lead times with the highest quality sheet metal parts possible. Our Hooksett, New Hampshire office is networked with Windows NT, from quote to shipment, on all of our terminals. The production control software, iQS Manufacturing Control from Sector Software, Inc. links each terminal so that we can track your orders from start to finish, while ensuring on- time delivery of all your orders. We utilize CNC machines such as Amada Punch Presses, Mill Centers and Press Brakes as a means to speed our manufacturing ability and increase accuracy. Since these machines are easy to setup and run, and since programs can be quickly loaded, they allow a very short setup time. Once a program is verified, thousands of identical workpieces can be easily produced with precision and consistency. The ability to machine complex shapes and difficult angles in a single setup reduces our labor time and improves automation. See our Facilities List. Welding is the most common way of permanently joining metal parts in sheet metal fabrication. It is also a complex process that requires precision, accuracy and safety procedures. Specific types of sheet metal need specific control over heat. Our welding department includes highly skilled craftsman with a wide range of experience. We provide quality welding work on everything from light gauge aluminum to heavy steel frames. We maintain strict quality control and codes of ethics for our sheet metal welding processes. See our Facilities List. We offer a multitude of finishes from raw metal to polishing, painting and plating. We can service all of your plating and painting needs. Plating is a surface covering in which a metal is deposited onto a conductive surface. Plating is used for many reasons including paint adhesion improvement and corrosion inhibition. Painting is used for a number of reasons ranging from decoration to protecting the metal surface. We offer a wide variety of powder and wet paint, allowing us to match practically any color to suit our customers' production painting needs. Powder coating differs from traditional painting in the materials and manner in which it is applied. Powder coatings are applied electrostatically and, after the application of heat, soon become much harder and more durable than liquid based coatings. Powder coating is exceptionally hard and resistant to most organic solvents. Silk Screening is a versatile printing method because it is a suitable application on most any surface, including metal surfaces. Metal silk screen printing can be used to apply corporate logos, designs or product warnings. Silk Screening can be done on bare metal parts or metal parts that have been plated, painted, or powder coated.